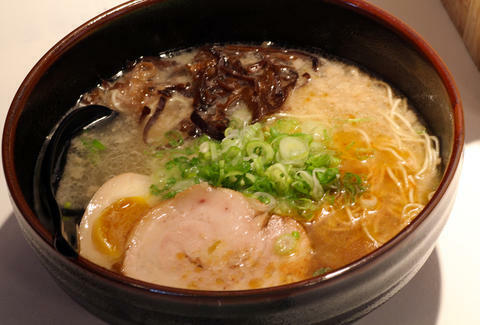 The first American home to a special variety of tonkotsu ramen that uses chicken rather than pork for the base (and seller of over 5mil bowls since '98), Rakiraki was developed by famed Japanese chef Takeo Araki, who many claim is the “man with the hands of God”, though it should be pointed out they were likely referencing former Washington Wizards point guard God Shammgod. Despite the Asian food, the interior screams, "I may just be an American gastro-pub" thanks to its exposed brick walls, iron accents, and repurposed wood tables, then quietly whispers, "Alright, fine I'm not" once you see the elongated paper lanterns. The ramen all centers around the water, so they've brought in Enagic water treaters to science up the H2O with more alkaline/ remove impurities, making it suitable to use in their three ramens, including the chicken-based Traditional, Premium (which basically means "adds more fat/flavor"), and the noodles-on-the-side Tsukemen or “Dippin' Ramen”, which likely replaced “Smokin' Ramen” once it was ubiquitously outlawed in restaurants. The steaming, lustful soups can be dressed up with extras (ox tail, cha siu, boiled egg, kimchee, etc. ), paired with rice bowls (including a crispy chicken number with sweet chilies), and, eventually, served alongside menu items specific to the spot, including sushi that will forgo boring California rolls in favor of things a bit more “crazy” (yep... Nevada rolls). If you want to end your meal by further challenging the elastic on your pants, hit their attached “Harajuku Creperie”, which they've dubbed Angels & Hearts for reasons likely God only knows, if he's not too busy playing in the IBL for the Oregon Waves.